The NM Engineering Power Module is a device which easily allows most able person to upgrade the performance of their new MINI Cooper F56 without reducing the reliability or integrity of the engine, clutch and driveline. This is the simplest and best alternative or option to chip tuning. The NM Power Module is an all new proprietary tune box designed specifically for the F56, not some rebranded 3rd party product for the BMWs. It is a plug and play box that intercepts the T-MAP sensor and can be installed or removed within minutes without any detection. The electrical components are housed in a billet aluminum enclosure which is protected from the elements and is designed and manufactured to be positioned within the engine bay of your vehicle. The wire harness is manufactured using automotive quality wiring which is both oil and heat resistant, and has the same OE water proof connectors as used on your engine. Power Module can be sold or transferred to another vehicle of the same engine type. 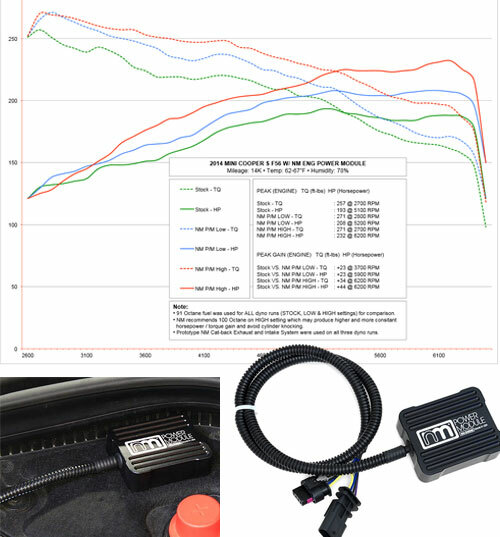 Notes: OBDII displays actual boost and not compensated, which makes the module compatible with all OBD reader/scanner, such as: Scan Gauge, P3, PLX, Torque Pro, etc.